Best daily wisdoms of happiness for enlightenment. If you’re seeking for happiness quotes, you’re seeking nowhere but this app! 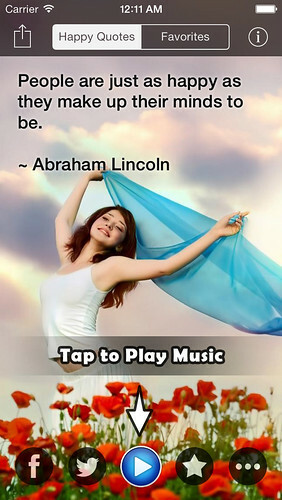 It has great peaceful & relaxing songs that you can listen to while reading quotes. With hundreds of great happiness quotes, this app will definitely give you a better spiritual life. These quotes will make you happy from the inside, because that’s where true happiness comes from. With the ease-of-use design in mind, you just need to swipe left & right. It also has different options to customize your look & feel. ● 500+ happiness quotes from great people. ● 20 great peaceful & relaxing songs with a nice music player. ● Beautiful & relaxed background pictures.